HERE ARE SOME HELPFUL ANSWERS TO SOME POPULAR QUESTIONS! When are you open and how much does it cost? Find out all the information you need on our Visit Us page! Yes, all well-behaved dogs on leads are welcome. Please remember to pick up after your dogs and use the bins provided. Can I eat in the field? Whilst we know that our fruit is irresistible, please refrain from nibbling as you pick. 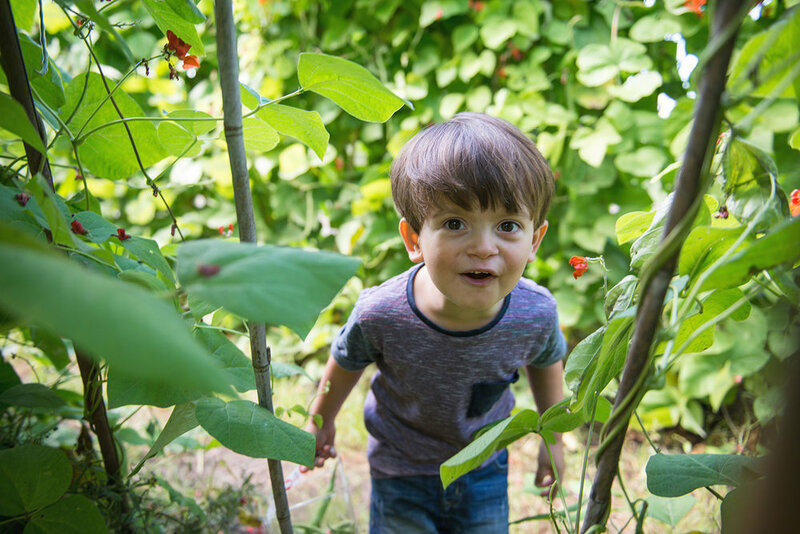 Once you’ve finished picking and have paid you’re more than welcome to enjoy your fruit in the picnic area – maybe even treat yourself to a cold drink and cake to go with them! What fruit and vegetables do you have? Please call the answerphone on 01793 790137 to find out exactly what we’ve got before you visit. Where can I find all the fruit and veg? You’ll see signs across the PYO helping you find what you’re looking for, but if you’re stuck just ask a member of staff. We encourage people bringing their own containers or reusing ones from previous visits. If you’re bringing your own, please have it weighed in the shop before you go into the field so we know how much to take off your final price! Our table-top picking fields are wheelchair accessible, as are our Farm Store, café and toilets. If you require any assistance, please speak to a member of staff. How do I know which strawberries are best to pick? Hunt through the plant, often the best strawberries are hidden in the middle or are hanging underneath and don’t be fooled by the white patches, these are really tasty too. Big isn’t always best, some of the smaller fruits can really pack a tasty punch. How can I pick fruit to make it last as long as possible at home? When you pick strawberries, make sure you take a little bit of the stem too - pinch the stem between your thumb and finger to make it break easier. Pop them in the fridge too when you get home and they should last three to four days. If you’re into smoothies or the like, you can freeze them until you’re ready to use them. Just cut off the stems and chop them up before putting them in the freezer. They will last two to three months in the freezer but once defrosted they will lose their shape. Do you offer pre-picked fruit and veg? At points through the season we will offer pre-picked vegetables from the farm shop, but we don’t pre-pick our soft fruits – these are always best when straight from the plant. No they’re not organic but we do limit the use of chemicals and use gentler ways of controlling pests and problems. For example, we use food-grade potassium bicarbonate – that’s bicarb of soda, exactly the same as what you’d use in your home baking – to eradicate mildew from the strawberries. If you’re interested in finding out more about how we grow our fruit and vegetables, come and have a chat with the team – they’re always happy to talk about the fruit! Do you sell the cream to go with my strawberries? Yes! We have local cream from Berkeley Farm Dairy in Wroughton available to buy (whilst the day’s stocks last). We have milk in the shop too and there is also a milk vending machine just by the entrance to the dairy parlour. This is all from the cows that live on Lotmead and is produced on site by Jojo’s Dairy. It’s pasteurised but not homogenised, so you’ll have the old fashioned layer of cream on top! Yes we have a café and farm shop just at the entrance. The café serves a great selection of snacks and drinks, including homemade cakes, as well as ice creams. We have free drinking water available too – there’s a tap by the side of the Farm Store and next to the hand-washing facilities too. Whilst you’re there, have a look around the farm shop too – we have some lovely treats and frozen meals for a quick but special dinner. Yes, please feel free to bring your own picnics - we have plenty of picnic tables. Don’t forget the café is always open too for a hot tea or coffee, a cold drink or ice cream. Don’t forget to pop your rubbish in one of the bins provided before you go too! Yes, baby-changing facilities are available in the toilet block. Are there age restrictions on the play area? Our play area is designed with children aged up to 14 in mind. Please look out for the signs for any restrictions on specific equipment. All children must be supervised by a responsible adult whilst in the play area. No, we have lots of parking at Lotmead and it’s always free. What else is there to do at Lotmead? Lots! We have a play area to keep the little ones happy, with a brand new Strawberry Trail play area for 2018. There is also the small animal enclosure with lots of pigs, pygmy goats, ducks, geese, alpacas, calves and rabbits – as well as old-timers Tango the Shetland pony and Denzil the donkey. If you walk through the small animal enclosure you’ll also see the signs for the nature trail – a 1km walk through the wooded area to a bird hide, as well as the dairy parlour. Unfortunately not. All of the animals in the small animal enclosure are on a carefully monitored diet and may bite, especially if there’s food involved. We also don’t want them to start developing bad habits and pester our visitors for food all the time! Can we go anywhere on Lotmead? There are lots of places to play and explore at Lotmead, but please keep to the areas on our map. Lotmead is also a working dairy farm and business centre so not all of it is open to the public. When you’re visiting the dairy, please obey the health notices and stay in the designated areas. All children must be accompanied by an adult at all times. Some of the strawberry beds will be closed at different times too so that they can have a rest and time to grow more strawberries. Do you take large orders for fruit? 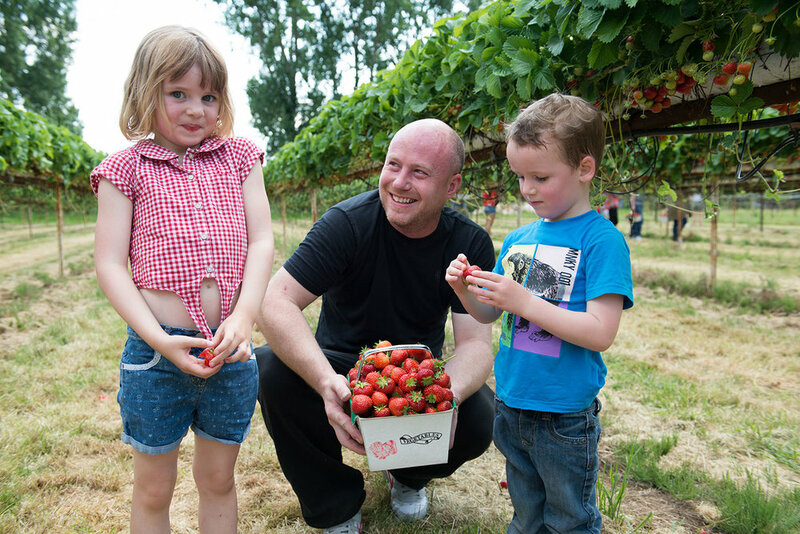 We’re happy to speak to you to arrange a picking service for large orders – strawberries are a perfect part of any menu for a summer wedding, party or other get-together. Email us on info@lotmead.co.uk to find out more.